At the same time as these commentators have obsessed on France’s rising public debt, they have almost entirely ignored the rapid increase in French private debt, which has paralleled the public sector’s borrowing. Since 2007, households have increased their debt burden from 45% to more than 55% of total GDP and businesses from 53% to 70% of GDP. In total, the increase in private debt has matched that of public debt. This brings to light some particularly disturbing trends. First, French public debt growth during this time of crisis has not created the conditions for private sector deleveraging, as would normally be the case. Second, whereas public sector debt is a widespread problem in Europe, France is the only large country of the Eurozone that has experienced a private sector debt increase, let alone a spike of such magnitude. In particular, the rise of corporate debt, unmatched at the European level, creates concerns about the health of French company balance sheets and corporate exposure to risk. France’s financial interdependence with the rest of the world also raises a question of the potential impact on the international economy. 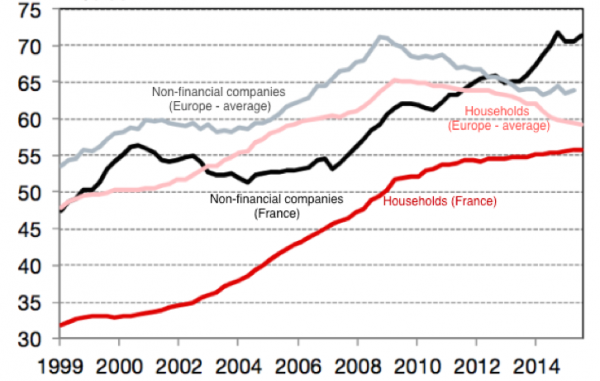 The French case stands out all the more considering private debt levels are going down throughout Europe. In Germany, corporate debt levels have remained as low as they have been during the last decade. Even for “bad students” like the United Kingdom or Spain, corporate debt has been reduced significantly, often through a very painful deleveraging process. Compared to its European neighbors, France has historically known very moderate levels of corporate debt. But that has changed dramatically in recent years. In 2014, for the first time, French debt exceeded the European average and gives no signs of slowing down.5[v] Debt divergence at the European level is not a new phenomenon and should not always be seen as a warning sign. However, in some cases, it clearly is. Spain’s 2003 - 2007 corporate debt boom, for example, shows that some rapid rises in private debt are indeed the sign of increasing financial weaknesses in the corporate sector and economic imbalances at the European level. The increasing reliance on debt financing by French firms has, for the most part, been ignored by contemporary observers because standard economic theory holds it to be unimportant. The capital structure irrelevance principle (Modigliani & Miller, 1958), accepted by the majority of economists, states that the value of the firm does not depend on whether it chooses to finance itself through stock or through debt. With perfect capital markets, a firm is indifferent to issuing debt or emitting stock. In this interpretation, changes in corporate debt levels could be seen as relatively benign inasmuch as they only indicate irrelevant alterations of the corporate liability structure. I argue, however, that a more careful scrutiny of corporate balance sheets rules out this simple explanation of the phenomenon. First, the financial situation of French companies has little in common with the forced deleveraging of Italian or Spanish firms. 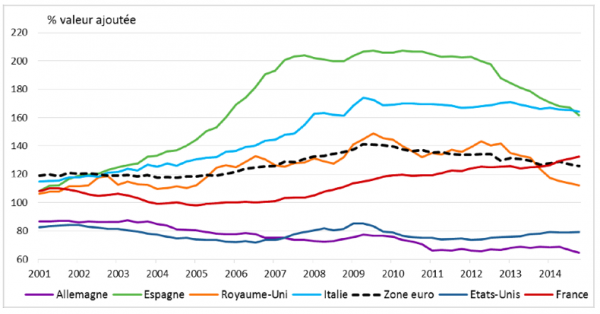 The savings rates of French companies are their lowest in Europe and seem to be on a downward trend. Moreover, firms do not seem to be taking measures to reduce their debt burden in the near future. This has macroeconomic consequences. In the rest of Europe, economies are depressed and suffer from low demand in part because of the challenge of debt deleveraging. This is, however, not the case in France. In France debt has been increasing but French economic results have still been disappointing. The French economy has experienced lagging growth and a stubbornly high unemployment rate, even by European standards. Instead of benefiting from debt-driven growth, the French economy shows no signs of economic recovery. Over the past three decades, French corporate finance has had a long history of rapidly changing patterns of capital structure with very volatile debt ratios and successive expansions and contractions of corporate debt. The story begins around 1990. At that point, debt had slowly become a marginal and irrelevant means of financing for French companies. This steady decline of debt as a tool of corporate finance was driven by two factors: first, a reduced reliance of French companies on external financing, and second, the replacement of bank finance by market finance. This led to a very quick debt deleveraging by French companies, at a scale comparable to that of more recent European episodes. From 1970 to 1988, private debt declined from 85 to 60 percent of added value. This corresponded to a parallel rise in corporate self-financing rates (taux d’autofinancement) that measure the ability for a company to finance its investments internally without the need for external financing. Self-financing rates jumped from 60 to 120 percent of added value at their highest point in the 1990s. For the first time in decades, debt became an irrelevant part of the financing of corporate investments. The boom in market finance resulted in major changes in the structure of credit and in the balance sheets of major French corporations. On the one hand, stocks and shares became a much more common instrument in the liability side of the companies’ balance sheets, partly replacing debt. On the other, market debt instruments such as bonds took over a large part of the credit market that was once managed by banks. This change also appears in aggregate data of corporate balance sheets. In other words, France, which has been for a large part of its economic history an “economie d’endettement” (economy of debt)[vi] was, at least in the corporate sector, moving away from borrowing. In the late 1990s, debt had become nothing more than a marginal component of companies’ balance sheets. However, some signs were already present that the trend was about to be broken. When economist Patrick Artus wrote[vii] about the question of corporate finance in the late 1990s, his main question was: will France move back towards debt again? And indeed, it did. That reversal occurred shortly thereafter with the rapid surge in corporate debt between 1999 and 2001. The data provided by the Banque de France on corporate balance sheets presents some insight on what happened during this short period. [viii] The first graph represents the uses of financing and the second graph the sources of financing for private companies. As a purely accounting equivalence, the sum of all money flows being used should match the sum of all the money flows coming in at every period. • Corporate savings have been quite stable through time and debt appears as a residual mode of financing. Starting in the mid-1980s we observe volatile debt flows from year to year that at times reached peak as well as extremely low values (disappearing shortly completely in year 1997 - on this precise year, companies lent more than they borrowed). •The development of financial markets can be read on the side of the sources of financing: the stocks and shares band got progressively bigger and went from being negligible in the late 1970s to overcome debt as the main financing source outside of savings. •On the side of the uses of financing, investment has been an extremely stable variable. This is slightly counterintuitive considering investment is often considered the most volatile part of the business cycle and its variations can be linked to most of the booms and busts of recent economic history. On companies’ balance sheets, direct investment flows appear as a bedrock: companies use the remainder of their financing in a very volatile way, buying stocks, shares and bonds to balance their balance sheets in the end. Between 1998 and 2002 something however clearly happened to alter this pattern, both on the asset and the liability side of the companies’ balance sheets. On the liability side, there was the creation of a large amount of new company debt; on the asset side, set side (second graph), there was a massive increase in “actions et participations” (stock and shares) and “autres placements financiers” (other financial investment). In other words, the very large debt creation of the early 2000s was not matched by an increase in real direct investment but was exclusively used to finance portfolio acquisitions. At the time, this phenomenon was seen as “external expansion” of companies, brought about by the buying of shares in other companies, relative to “internal expansion,” which would have entailed investment. The Banque de France itself[ix] pursued this line of analysis in its report at the time. But the phenomenon was much less benign or financially sound. This cannot be understood without referring to the dot-com/tech bubble. French companies were using debt to purchase the shares of tech companies with new technologies, and in so doing they helped push up the demand for these assets and contributed to the bubble itself. The graphs highlight the financial strategy of French companies during this time and how they contributed to the tech bubble. More specifically, French companies increased corporate debt to buy stocks and shares in what can only be called a speculative tech boom. In other words, it is not possible to explain the great surge in French corporate debt at the time[x] as simply a case of besoin de financement, “need for financing,” as the difference between the investment rate and the savings rate. The besoin de financement was by no means exceptionally large in 1999-2002 or in 2010-2015. In both cases, however, corporate debt increased rapidly. By examining companies’ balance sheets more closely, we see that the growing importance of financial investment and its high volatility was a much more determining factor in the growth of corporate debt in France. In this case, it would be wrong to see the liability side of companies as a zero-sum game between stocks and debt, whose dynamics are complementary to each other. Obviously, this pattern of corporate expansion was quite fragile and carried with it enormous risks. When the American asset market prices finally collapsed in 2001-2002, France was the European country where the crash was felt the hardest. In total, the French stock market index CAC40 lost more than 60% of its value over the episode. The three major French companies that were the most in debt, France Telecom, Vivendi and Alcatel all faced bankruptcy and had to sell a large share of their assets to other European companies less exposed to the crash to survive. In Vivendi’s case, the wrath of the shareholders led to a long series of lawsuits that lasted nearly ten years. I argue that this historical example provides insight into the contemporary French corporate debt surge. Before laying out my case, I examine three other possible explanations for the phenomenon. I argue that they are at least partly insufficient to understand the present buildup in French corporate debt. The first line of explanation sees the increase in debt as a reflection of stress in French corporate balance sheets: French companies have, since the crisis, faced a very difficult economic context of falling sales and profits. In these emergency conditions, they resorted to debt en masse in order to continue respecting their commitments to future cash payments. The explosion of French debt expresses nothing more than the economic struggle of French companies and their inability to recover from the 2008 crisis. It is true that recent data on the main aggregate performance variables of French companies point to a bleak situation. The margin rate and the savings rate are significantly down since the crisis, explaining the inability for French companies to sustain profits large enough to meet their financing needs, particularly in terms of investment. Considering the French model was partly founded on a very high level on self-financing, and low reliance on credit institutions and markets since the 1980’s, this is a particularly significant problem. In response to falling profits, the behavior of many European companies has been to cut investment, and European investment rates have, thus, lagged behind the rest of the world. 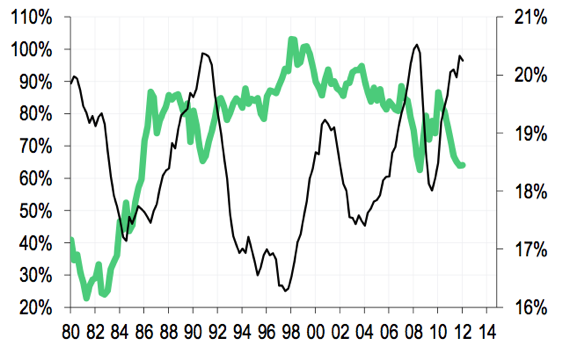 In the French case, however, data shows investment has been surprisingly resilient. In a situation where investment is relatively inelastic to the rest of the companies’ financial performance, it is easy to see debt buildup as the only possible adjustment variable on the balance sheet of French companies. A second hypothesis argues that an increase in corporate debt is a rational finance decision in today’s world of low-interest rates. In such a world, French companies are merely acting rationally to borrow at how interest rates, and in so doing, they are significantly bringing down the cost of financing through debt. It is indeed true that it is now less expensive for French companies to go into debt than it has ever been before. Interestingly, bank credit interest rates initially collapsed much faster than rates on bonds. The spread between the two rates has only started to disappear in the recent years. [xi] The question that remains unanswered, however, is what is the reason for the French divergence from its European neighbors. Low-interest rates are a widespread European (if not global) phenomenon and we would need a very specific explanation for the unique behavior of French companies on the European level. A third explanation would be institutional. The recent increases in debt levels is nothing more than a return to normal for the French economy - the old économie d’endettement (debt economy of the 1970s) where debt is central to companies’ balance sheets and interest rates are at an acceptable level. This new “old normal” corresponds to an equilibrium where the corporate capital structure mostly consists of debt. This interpretation would encourage a certain optimism. Thanks in part to very high levels of public debt, France enjoyed a relatively low level of private debt since the 1990s. Now that pressures on public debt are tightening, there is room for private debt to increase and to adjust for austerity policies, budget cuts and tax increases. While these hypotheses are in part feasible, they do not fully explain the increase in French corporate debt or its divergence from the rest of Europe. For this, we need to take a closer look at the assets held on company balance sheets. This would let us understand if the dynamics involved with the recent debt surge look like what we saw in 2001. To get at this question, we need to see whether French corporate financial investment is expanding much like it did in the late 1990s? The answer is yes, on a massive scale. Corporate financial investment has increased by more than 40% since 2008, reaching 700 billion euros. Such an increase is unmatched by any other major economic aggregate, except corporate debt on the liability side of the companies’ balance sheets. While coincidence is by no means causality, accounting lets one understand how private sector debt is correlated with an expansion in corporate balance sheets. On the asset side, companies hold more bonds and shares. On the liability side, these holdings are financed by an increase in corporate debt, either debt that is borrowed from banks or that is issued other financial agents. Looking at the balance sheets of French corporation, this is the only logical conclusion an analyst would be able to draw. That means that companies that are listed as non-financial, with regards to French national accounting, are actually acting much like a financial institution that would use leverage to multiply its returns on investment. Moreover, by borrowing, they are pushing up the demand for assets and contributing to the asset bubble, both domestically and abroad. In this regard, the link between the rise in French corporate borrowing and the rise in global stock markets since the 2008-09 financial crisis can be seen as a classical example of the transmission channel between interest rates and asset prices at work. Low-interest rates make it attractive for investors to borrow to buy assets on financial markets. This, of course, creates financial market risk—that asset prices will fall and losses on borrowed money will be incurred. In the case of French companies pursuing this strategy, the risk is actually greater because it would not only reinforce but magnify the transmission channel of a potential financial crisis from the financial sector to Main Street – or to the “real economy.” Many French companies are dangerously exposed to a fall in asset prices, which would put at risk their ability to continue their operations at current levels of employment and investment. Let’s look more closely at what kind of companies are actually engaging in this financial activity. Company size seems to be a critical variable for corporate debt growth. The debt levels of small and large companies have recently diverged significantly. Large companies, in particular, seem to be the main driving force of the contemporary debt expansion. This divergence is far more recent than the financial crisis itself. Up to 2010, the debt level of small businesses closely followed that of the large corporate sector. 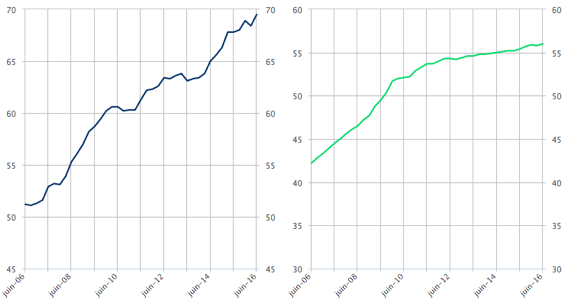 These parallel trends have since then broken down. This observation is true whether we consider the total stock of debt or the ratio between debt and added value produced by the private sector. Again, there is a clear parallel with the 2000-2002 years. In both cases, large companies have increased their debt liabilities whereas small businesses have been reluctant to do so. As a result, debt ratios have rapidly increased for large companies but have remained constant for small businesses. It is interesting to note that in the earlier period, the divergence was significant but short-lived. In 2003-2004, after the Tech bubble had burst, the abnormally large company debt ratios went back to the normal. 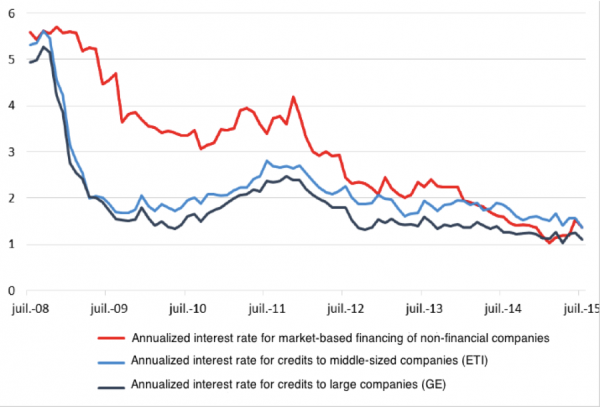 In sum, big companies have been borrowing more since 2010, and small companies have been borrowing less. A simple explanation for this divergence could be the credit constraints small businesses may be facing after the financial crisis. A very interesting ratio that the Banque de France makes available is charges financières sur endettement financier, which represents the ratio of income devoted to debt service on the stock of debt. It presents a good estimate for the effective interest rate for businesses. 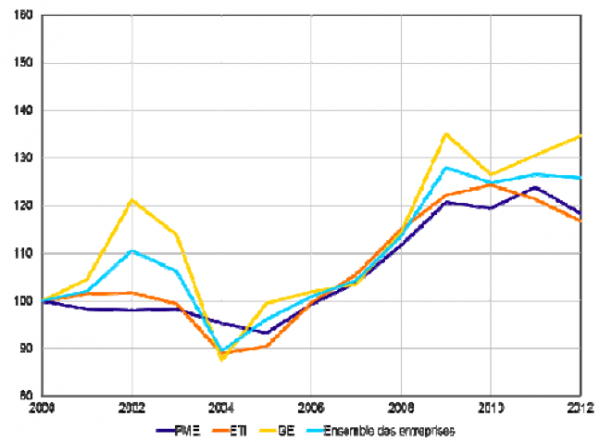 The charges financières sur endettement financier shows that the effective interest rate for large companies has dropped even more significantly than for small businesses. In this sense, large company debt levels may be nothing more than a rational financial decision relative to the very low interest rates those companies are experiencing. Based on this information and on structural changes in the balance sheets of large corporations, my argument is that the increase in French corporate debt reflects a definite financial strategy in which companies create a large quantity of debt in order to acquire stocks and shares. This strategy can only be pursued if two conditions hold: access to low-interest rates and to the international asset markets. These two conditions are much more easily satisfied by large rather than by small companies. In this light, any divergence between large and small companies is particularly significant. As for the lenders, it is crucial to evaluate the exposure of the financial system as a whole to the French private debt surge. This requires looking into who precisely is lending to the corporate sector. The increased default risk associated with a rise in leverage of some non-financial companies may spill over to the lenders. It is in particular essential to see if banks are involved in this private credit surge. or six years in favor of market-dominated instruments such as bonds. Evidence shows that this is indeed the case. For example, Banque de France data shows the share of bonds in the aggregate domestic financial debt went from 15% to nearly 25% over the course of a few years. Such a composition is not unheard of in the world of French corporate finance per se. Tellingly, it reached the same levels in 2001. French accounting data draws the line between “investment credits” (crédits d’investissement), which correspond to long-term loans taken out by the corporate sector, and crédits de trésorerie, short-term liquidity loans companies may need when facing liquidity constraints or to balance their balance sheets. In total, investment and treasury credits represent only a fraction of the total amount of corporate debt. In particular, a large quantity of bonds does not fall in either category. Credits d’investissement have in fact increased at a constant speed since the early 2000s, nearly tripling in size in the process. The major question is which kind of investment this corresponds to and its productive nature. A more detailed analysis of the uses of these investment loans would be probably needed. The hypothesis made earlier in this paper is that they in a large part only correspond to external expansion and asset acquisition by companies, rather than real direct investment. What is much more concerning, however, is the trend in crédits de trésorerie. In recent French financial history, high levels of treasury loans have systematically been correlated with periods of increased financial instability: both the internet bubble (2001-2002) and the financial crisis of 2007-2008 have corresponded to very high increases in crédits de trésorerie for private French companies. The logic behind it is simple: companies experiencing financial strain are often forced to roll over their debt burden by issuing or taking on short-term debt. Since 2015 the stock of these short-term loans has again increased significantly, reaching the crisis levels of 2007-2008. 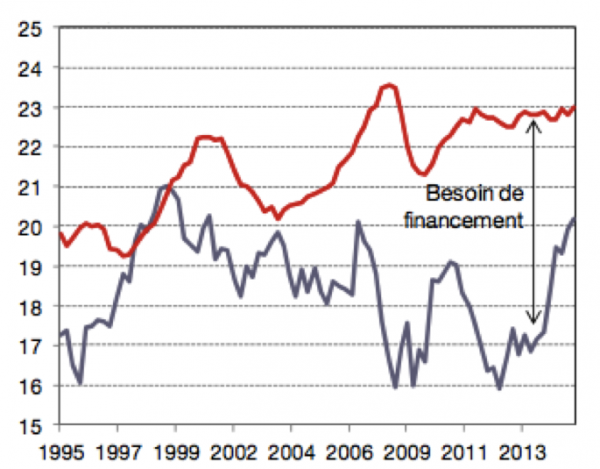 Such a trend illustrates increasing financial stress in the French corporate sector. If some French companies have reached unsustainable levels of debt, a sudden surge in short-term credits could indicate that they are struggling to manage their debt or worse close to collapse. In this case, many French companies would be just one major market correction away from a crisis. French corporate debt is an issue for international capital markets. First, it may have the effect of distorting financial markets abroad, just like it did during the tech bubble, when some French companies contributed to the asset price bubble in the United States. Second, non-French actors may be exposed to French corporate debt. In this case, a series of French defaults on private debt could have serious financial market ripples. The French corporate debt buildup is so large that it appears in a very striking manner in French capital account data. 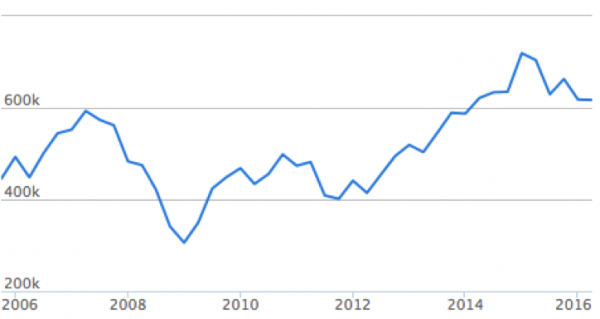 The capital account of France has since 2008 been constantly positive. In other words, more foreign companies have invested or lent in France than French companies have invested or lent abroad. However, this net results hides the fact that French companies abroad have substantially increased their direct investments and their portfolio investments in stocks and shares (or the order of 200 - 250 billion euros each). In order to keep the balance of payments at equilibrium however it must have been the case that foreign companies have in parallel made massive acquisitions of (qualitatively different) assets in France, mostly debt. 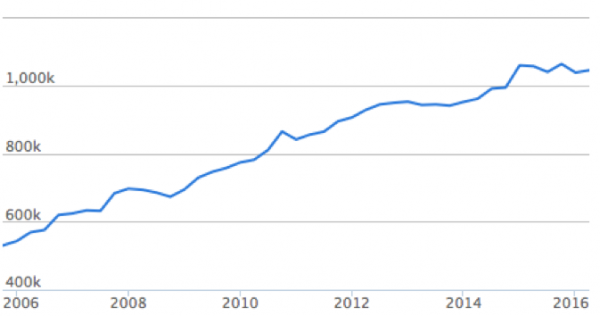 For example, Figure 13 shows that direct investment by French companies abroad has rapidly increased since 2007. Direct investments held in France by foreign companies have also rapidly increased which means that overall, the net position of France in terms has eroded further. This should not, however, hide the fact that gross flows of direct investment both ways have nearly doubled since 2007. 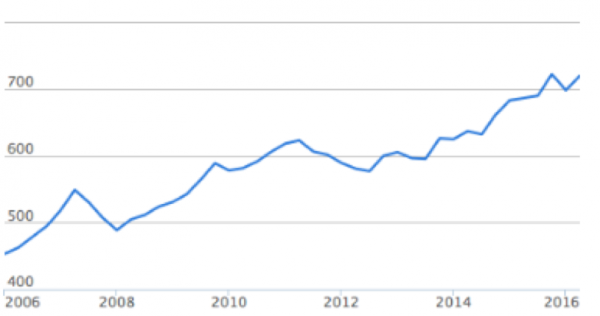 Capital account data concerning portfolio investments is even more interesting. 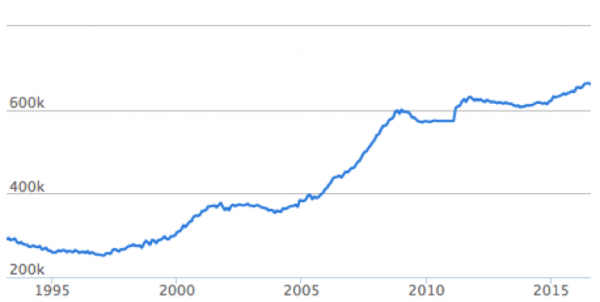 Like for direct investments, the net position of France has been going down overall. This, however, hides major discrepancies from one category to the other. In the case of debt instruments, the net position of France has collapsed. French agents have borrowed much more abroad than they have lent. Starting with the 2008-2010 crisis, French debt liabilities to foreign institutions have experienced a very steep increase, while foreign debt held by French domestic residents, has not changed. On balance, French residents seem to have borrowed in large quantities from foreign banks or institutions. In the case of stocks and shares, the picture is much different. Here, the net position of France has improved considerably. Since the major drop in foreign asset holdings that followed the financial crisis, stocks, and shares held by French domestic agents have increased by more than 200 billion euros. In other words, French companies seem to have bought shares not only on French asset markets but also on those abroad. • French agents borrow massively from abroad (which means their foreign liabilities increase considerably). This also is in line with the fact there is no important borrowing of French companies in French banks. • French agents (plausibly, companies) have increased their foreign asset holdings of stocks and shares, at a very large scale, even if not compensating totally their increase in liabilities in the form of debt. At this stage, it is not possible to go beyond this initial dissection of the rise of French corporate debt. What comes out of this examination is nonetheless seriously concerning. Some economic actors, that appear in French national statistics as non-financial companies, seem to have followed a very simple strategy in the recent years. They have taken advantage both of low-interest rates and the boom in stock markets (in France and abroad) to expand their balance sheets by taking on more debt to purchase financial assets. This financial strategy does not seem to have done much good for a French economy still plagued by low growth rates and high unemployment. The increase in corporate debt has not contributed to the revitalization of the French economy through investment: investment rates have continued to lag behind previous levels. Domestically, France may be experiencing a kind of financialization whereby large companies increase debt to buy each others’ shares. By pushing the price of assets up artificially, they, in turn, make this strategy financially profitable, creating a lucrative spiral. Capital account data shows French companies may be pursuing the same strategy at the international level, borrowing on international capital markets to take advantage of the boom in some financial asset prices. 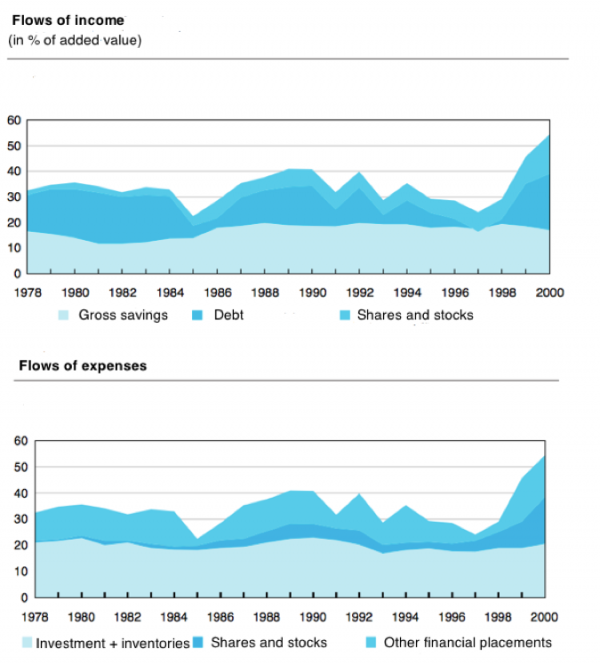 Considering the current price boom in the asset market, both in France and abroad, it is worth noting that this increase in absolute levels of debt can appear on the balance sheets as deleveraging: the increase in market value of the assets held by companies maybe higher than the increase in debt by the same companies. Such a process is however heavily dependent on the conditions of the asset market. Any collapse in asset prices may result in a significant increase in leverage for those companies. In a way, this situation has disturbing links with the economic rationale behind the “junk bond” story in 1980’s America. At that moment, many companies issued bonds to obtain the cash necessary to aggressively buy out other companies and extend their size very quickly. When a large quantity of these schemes failed, default rates on junk bonds threatened the system. The major difference is that French company debt often benefits from extremely good scores from ratings agencies. It is, however, possible to hypothesize that collapse in asset prices would expose the financial weakness behind a part of this debt. As long as asset prices remain high and interest rates low, there is nothing to fear. However, recent prospects of interest rate increases after the election of Donald Trump in the United States may prove dangerous to this strategy. The main consequence of the surge in French private debt is that systemic risk levels have increased. French companies have increased their exposure to asset prices and interest rates abroad. More than that, French corporate debt has, since 2014, not only accelerated: it has also moved its overall composition towards short-term debt, indicating increased financial fragility like it did in 2001 or 2008. The biggest concern for policymakers should be that it is non-financial companies that are affected by this debt increase. Those large companies are directly responsible for jobs and growth in a French economy where 31 % the workforce works for the 229 largest companies. If some of those were to collapse for financial reasons, the transmission channels to the rest of the economy would be immediate and serious.